Looking for Halloween entertainment for the family? Creepy Hand from Megableu will send shivers up your spine! Watch with trepidation as the full size, ghoulish green hand creeps around the table and points a bony hand at one of the players. Who will face a ‘Truth or Dare’ question? Are you ready for Creepy Hand, the scary take on Truth or Dare? The picked player must then choose a card – truth, dare or forfeit! Look out for the Joker cards – players can pass up their challenge and make another player carry it out! 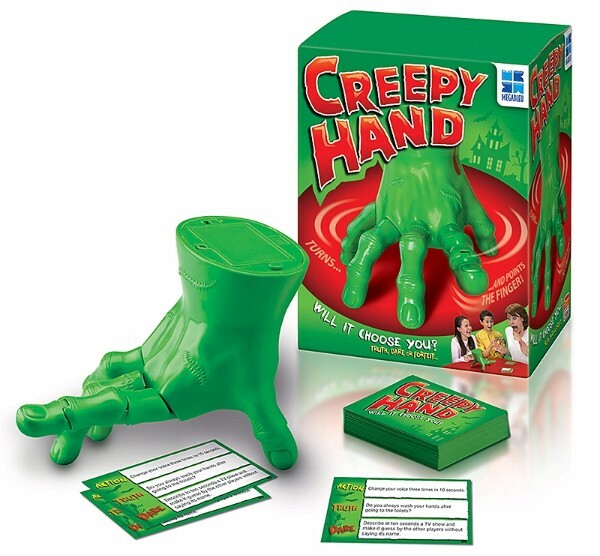 Creepy Hand is the scary forfeit game to entertain all ages on dark and blustery nights! • Exciting new take on truth or dare. • Who will creepy hand choose to complete the challenge? • Watch creepy hand move around and find and point at its victim. • Choose, a truth, dare or forfeit! Available to buy for £24.99rrp from Argos, Smyths, Toys R Us and more. The clown from IT! I am scared of clowns! The Woman in black in the film of the same name. Freddy Krueger still gives me nightmares. Oh, dear. I don't like scary characters so I don't watch them. Perhaps Hannibal Lecter? The Witches from Hocus Pocus are scary. the it clown ! cant watch the movie at all! I cant stand the clown doll thing from Saw HATE IT! Dracula! I love a bit of Gothic horror. Chucky is still terrifying, even though Child's Play is nearly 30 years old. Freddy Krueger - the first horror I ever watched! Chucky! Awesome but still scary! Has to be Freddy Krueger for me too, used to freak me out! Frankenstein. Author had great imagination. Also nowadays we can delight and Celebrate successful organ donation, and even face transplants have been successful, so much progress has been made in Health, Technology, etc. Those who have had transplants have been given the opportunity of quality of life. The Witches from Hocus Pocus. My favourite scary character has to be the aliens for Spice World movie - scarred me for life! The Creeper from Jeepers Creepers. I don't like horror films, so it would have to be a funny scary figure like Sideshow Bob. Does polymorph count?!! Not scary but funny! Ursula from the Little Mermaid. She's a great evil baddy! It has to be Pennywise the clown out of IT. I have just watched the latest one and have to say was pleasantly surprised it wasn't just a remake and had some changes from the original storyline. For me it was the Goblin King from Labyrinth. It scared the living daylights out of me when I was younger and I've never been able to watch it!! the witches in Hocus pocus !